Mr School Friend’s birthday went fairly well. What am I saying? It went very well. Mrs School Friend gave him a book, and so did I. Mrs SF also gave him a CD, which we sat and listened to on the by now blissfully normal-temperatured deck. 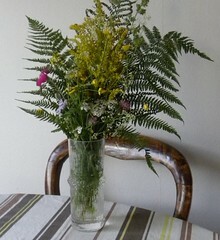 Pizzabella brought flowers that she just might have picked in the woods on the way. And why not? They matched the books nicely in colour. Which is all that matters. We ate a lot of wild raspberry cake, also picked in the woods. The berries. Not the cake. Wasps were chased and the Brio railway suffered a mishap. People felt sorry for the Resident IT Consultant for being surrounded by Swedes. The coincidental connection between my sister and Brother of School Friend has already been mentioned. I ended up chatting to Aunt B of School Friend. Strangely enough, she knew my sister even better. 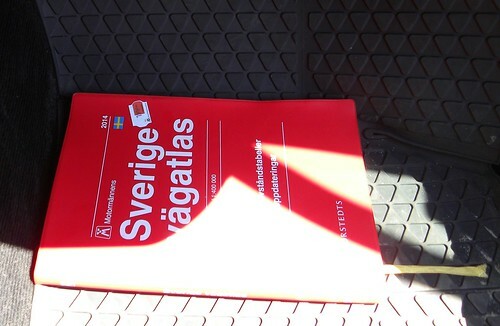 Sweden is such a small country, while seeming large on the surface. I’d better stop talking to people. Possibly give up cake as well. I know we did colours yesterday, but permit me to add a colourful, literary lady; Tant Brun. She is one of Elsa Beskow’s three tants, Green, Brown and Purple. 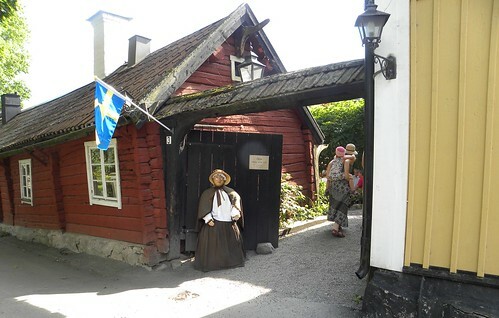 This one appears to run a café in Sigtuna. 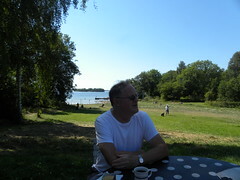 I was so full of having been ‘thrown out of’ another Sigtuna café the other day, that I completely forgot to mention Tant Brun. I bet she wouldn’t dream of behaving like that. 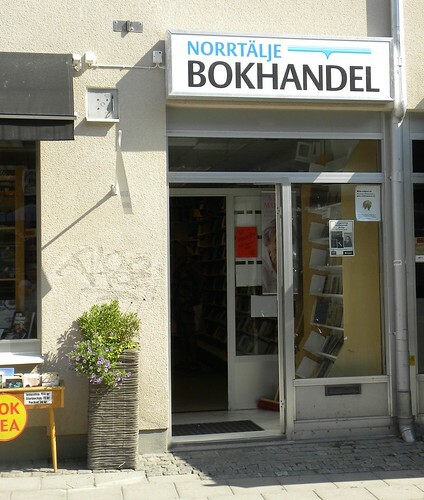 ‘All’ postcards of Norrtälje that I have ever received, have featured this bookshop. I found myself buying the same card myself, and sending it, despite there being many others. But the shop is quite pretty and as the Resident IT Consultant remarked, it grows inside and goes on and on. Rather like Blackwell’s in Oxford. As you will know if you called in yesterday, we drove south. 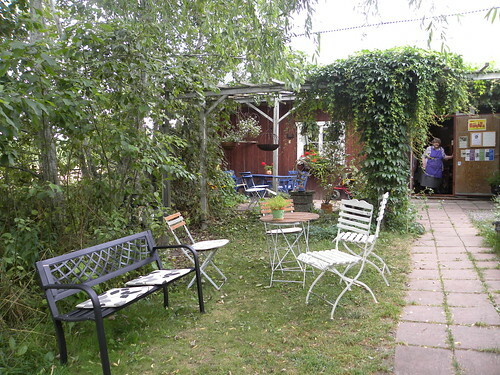 After enjoying another breakfast on the terrace overlooking Mariestad harbour, we went to visit my oldest sister. I have met her a few more times than her little brother, whom we saw last week. Unlike him she has no lake, but her flat boasts a larger garden than Bookwitch Towers, and much more forest. Very nice. Today is Mr School Friend’s birthday. I’m hoping for cake. And a party. Coincidence is an interesting thing, and I am fairly certain I will see Brother of School Friend, who was once – a very long time ago, it has to be said – class mates with oldest sister (which is stranger than it might seem to you). This is the book that brought us all the way north (well, more north than I am used to) and back again. Whenever the Resident IT Consultant asked how far it was to somewhere, I always replied ‘about an inch,’ because strangely enough, it always seemed to be. The atlas can rest now. We know the last part of the journey well enough to manage without help. Although it is a wee bit further than an inch. Bergianska Trädgården seemed to tick both boxes (never let it be said I demand a lot). So off we went and he dumped me and departed for his train. 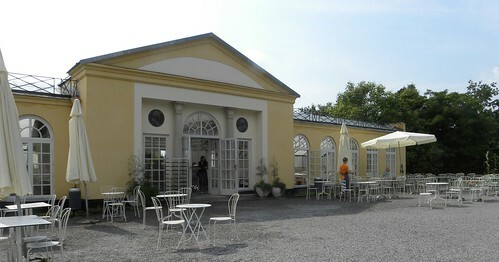 I sat on benches until the yellow orangery café opened, where I made a quick move on some rhubarb pie and tea. (I hadn’t actually said I had to have food. That was a bonus.) 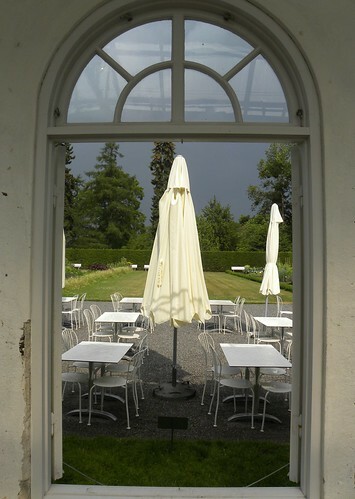 And then the grey sky greyed some more and the heavens opened and I had to grab all of the above and take refuge in the orangery. 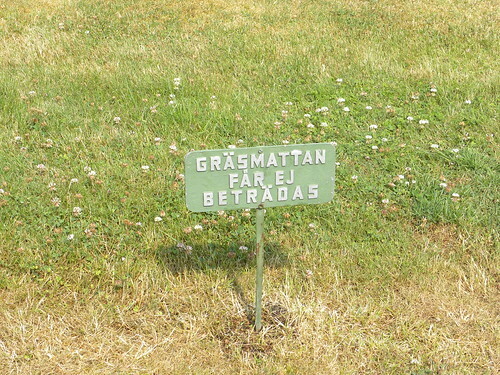 Was reminded of odd Swedish custom of signs telling you to keep off the grass. I find this excessive at times, but kept off the green stuff, just to be safe. We journeyed on after my brush with the open skies and the Resident IT Consultant’s fun train trip. Attempted to have lunch at an Ikea we passed (it was perfectly fine last week) but everyone in Västerås had returned from their holidays and the place was packed to the rafters. (Would have been if it had them.) Obviously, the first thing I’d do after a holiday is go buy meatballs and furniture. It’s the way to quickly get into the crush of things. Yesterday I saw the Retired Children’s Librarian. That is a phrase I have so far been unable to say on this blog, which makes it noteworthy. Saw her the day before as well. And before that it had been eight years. Bookwitch is only seven, which is why I’ve never said it on here. The RCL doesn’t travel much these days, and I find that the town where she now lives is – quite frankly – on the wrong side of the country. The town where the RCL lives is a lovely town. Don’t misunderstand me. It’s just not convenient. So, in-between lunch at her place one day and dinner at a restaurant the next, we went to see her niece at Växplats Nybyn, which is where the RCL does most of her work in the summer. My old mentor might be gasping for air in the hot weather, but she still helps her niece with serving coffee at her herby heaven in the countryside, almost daily donning a pretty purple pinny. If you think the photos look a little dark, I’ll just mention this was immediately before some magnificent thunder and lightning. Which did make it a teeny weeny bit colder. Not to mention wet. 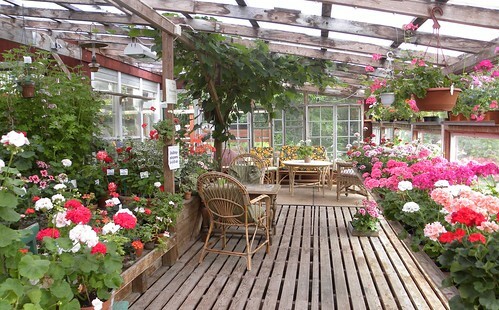 It’s a lovely place, even if it does have a geranium room, which is a sort of witchy hell on earth (me and geraniums don’t mix). Beautiful, but smelling of geraniums. 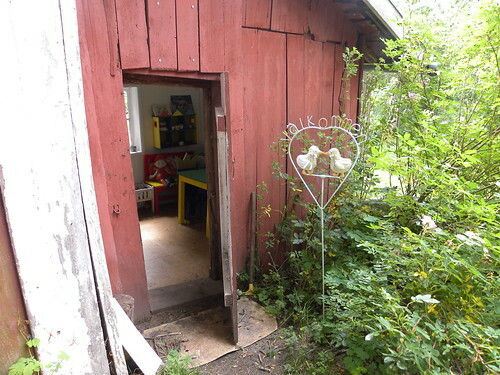 With a Pippi Longstocking hut for children, the niece has clearly had the same mentor I had. She used to have – pet – pigs, who all bore the names of children’s literature characters. How to sing an Irish baby song in Urdu. I was a lazy mother. Taking Offspring to playgroup was intended to take a load off me, for a couple of hours. The other children were meant to entertain, and so were the adult playgroup leaders. 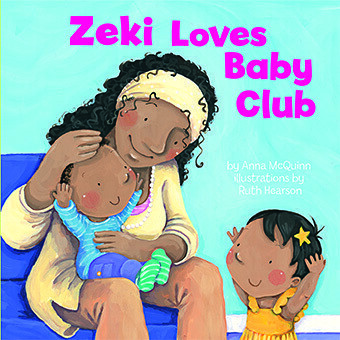 Here, in Zeki Loves Baby Club, the lovely parents all join in and play and sing with their child. True, the presence of the other babies means Zeki enjoys his Wednesdays, but there is a lot of adult playing and singing. It’s a very sweet book, with quite irresistible illustrations. It makes you want to go to this baby club, where children and adults alike have a great time, and the children doubtless grow up to become good people. At the back of the book you get the words to all the songs, including Rolly Polly in Urdu. Friday was Furusund day. Well, Furusund morning, anyway. 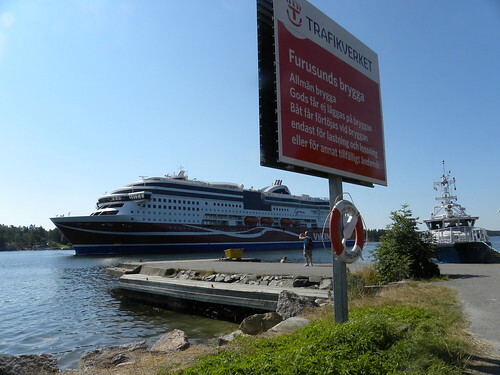 Furusund – which features in Evert Taube’s songs, as well as having been the holiday home of Astrid Lindgren – was smaller than expected. Nice, but there was no ‘downtown’ Furusund to speak of. You sit there looking at the sailboats, when along comes a monster boat. There was a beach we tried to look at, and a campsite we didn’t. 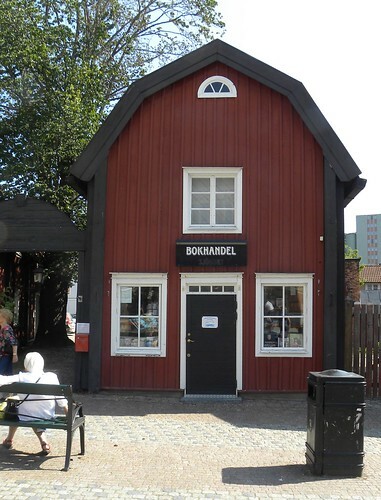 And there was a ‘Loppis’ – a local flea market – which sold tea and ice creams as well as other people’s cast-offs. 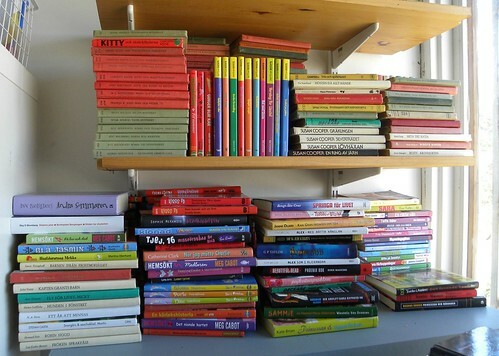 The Resident IT Consultant asked to be allowed to look at the secondhand books after he’d drunk his coffee. So we both looked at books. 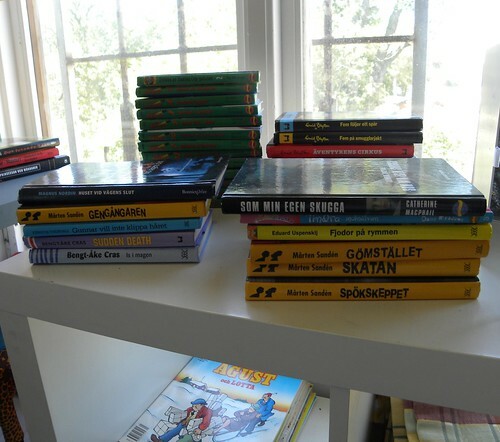 In the children’s corner they had plenty of Mårten Sandén novels. 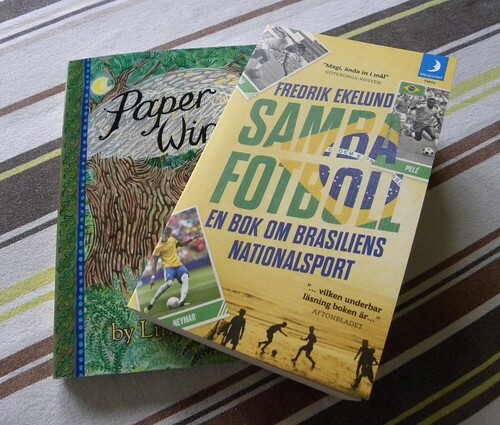 I didn’t need any more books, however, and the one sporting an English title on the cover which the Resident IT Consultant found, turned out to be in German. How old I felt! How old I am! 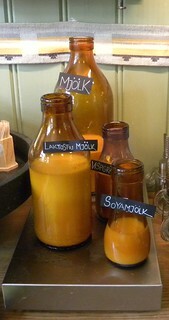 They had ancient milk bottles of the kind I used to buy when I was a tiny witch-let. I mentioned this to the girl in the café. ‘Yes, someone told me it was in the 1950s’ she said. ‘1960s’ I replied, trying not to sound cross. But what’s in a digit? It was all long ago. 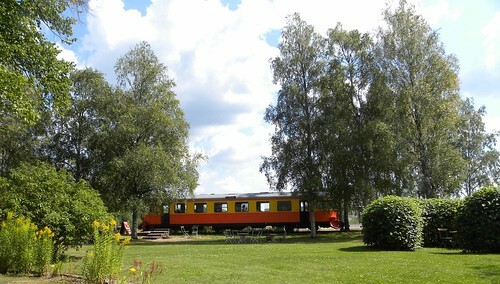 They had a train in the garden. (Well, actually I’m thinking it’s where the train would have been had the station not been a former station.) You could eat on the train. Or just admire it in a general sense. 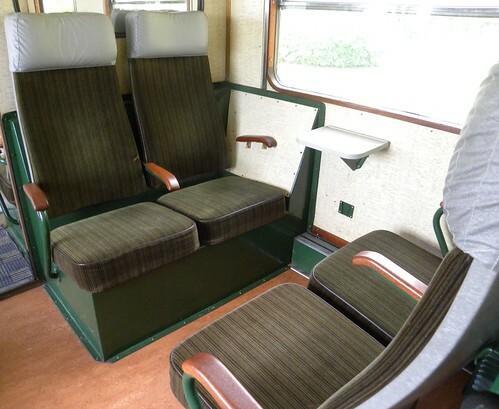 Needless to say I have travelled on trains like this one. And much more recently than the milk bottles. Didn’t feel like telling anyone that, though, as it might have made me sound older still. Later we went to see my – older – brother. This was our fourth meeting. 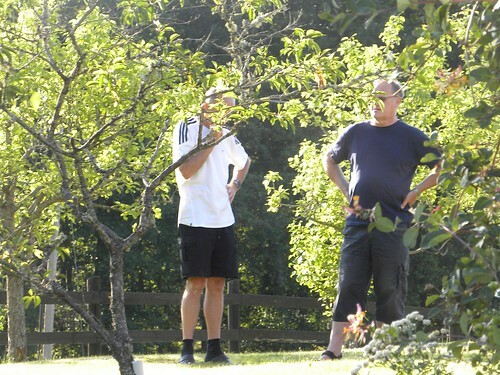 Here he is with the Resident IT Consultant after showing us his lands, and the pond he made himself. That was some pond. Had he not called it a pond I’d have said it was a lake. It even had an island in the middle. My sister-in-law and I agreed to disagree about Midsomer Murders. She loves Barnaby. I have decided that is fine. She thinks that Mikael Persbrandt (Swedish actor you are not – yet – too familiar with) is hot. I think the weather is.